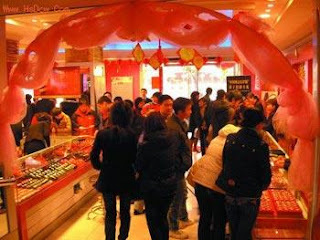 CCTV.com reports that festival shopping proves popular in China. The Chinese Lunar New Year, or Spring Festival, is just a week away, and supermarkets around the country are taking the opportunity to boost sales. In Beijing's supermarkets food, decorations and other goods for the Spring Festival are flying off the shelves, with twice as many sales as usual. Various red-colored goods, traditionally a lucky color in China, show that the New Year is approaching. Lanterns, posters and traditional Chinese costumes are all being promoted in the shops, which have kicked off big sales. And customers are happy to see an abundance of cheaper goods. One customer said "I came to buy some food for the New Year, such as candies and roast duck." One retailer said "We're offering big discounts ahead of the Spring Festival. Our sales have increased by more than 40 percent, while the number of customers is up by 20 to 30 percent." Department stores and shopping centers nationwide are also launching sales. The month previous to the Spring Festival usually sees sales totaling several months' worth. People's Daily Online reports that "New Year shopping" will attract largest expenditure by Chinese families for Spring Festival. What will urban residents spend most of their money on during the Year of the Ox Spring Festival? Latest survey shows that household spending in 16 of China's large and medium-sized cities will focus on three traditional consumption areas — Chinese New Year shopping (buying clothes, food and other goods to spend the Festival), visiting friends and relatives, and showing filial piety to parents (giving "hongbao," or red envelopes, containing cash and presents to parents). According to the survey, 41.4% of families said that of their Spring Festival spending, most will go to "Chinese New Year shopping," which was mentioned most among the various expenditures. This was followed by spending for "visiting friends and relatives," accounting for 27% of respondents. Spending for "showing filial piety to parents" ranked third, with 13.8% of the respondents mentioning this item. For many young families of two or three people, filial spending during the Spring Festival will become one of the largest expenditures as they will choose to give "hongbao," or red envelopes, containing cash and presents to parents. "Giving New Year's lucky money" and "leisure and recreation" were each chosen by approximately 10% of the families as their largest expenditure during the holiday period. In addition, 5.6% of the households chose "traveling". Many of these families have relatively high household income, relatively stable jobs and few household burdens. The survey also shows that Chinese residents are still willing to spend more during this year's Spring Festival compared with that of 2008, and over 80% are expected to spend more than or equal to what they spent in 2008. Meanwhile 30% of families are predicted to have larger expenditures than last year. Of them, more than 30% made it clear that they will spend 20% more than they did in 2008. In addition, 51.3% of families are expected to spend an equal amount to last year. Beijing-based China Mainland Marketing Research Company, a professional polling organization, conducted random interviews with 3,200 families in 16 cities on their consumption preferences for this year's Spring Festival in early and mid-January this year. The cities were Beijing, Shanghai, Tianjin, Chongqing, Shenyang, Dalian, Qingdao, Zhengzhou, Wuhan, Nanjing, Guangzhou, Shenzhen, Chengdu, Kunming, Xi'an and Lanzhou. China Daily reports that New Year's retail sales open with a bang. Retail sales on the first three days of 2009 rose 13 percent year-on-year, showing the government's efforts to spur domestic demand to prevent an economic slowdown are yielding results. The country's top 1,000 retailers earned a cumulative revenue of 12.5 billion yuan (US$1.83 billion) on the first three days of the year, according to a Ministry of Commerce survey, released yesterday. Daily necessities, including food, and clothes, shoes and home appliances sold at a discount recorded good sales, it said. Some cities did exceptionally well. Tianjin saw a dozen of its major retail shops record a 100 percent rise in sales to 200 million yuan. A ministry official said sales promotions and exhibitions from Jan 1 to 3, which were holidays, boosted consumption across the country. "A good sign is that many exporters have started exploring the domestic market as overseas demand weakens." Calling the New Year sales "an unexpected harvest", some retailers are looking for a good Spring Festival, the most important holiday in China. The "Golden Week" holiday starts on Jan 26. "We didn't expect to do so well because people were reluctant to dig into their pockets," said Wang Chunli, general manager of Beijing Caishikou General Merchandise. But Fan Zhijun, a Beijing-based manager of Suning, expects the sales to keep rising till Spring Festival. Suning is one of the country's largest home appliance retail chains. "The New Year holiday has seen only 30 percent of the consumers go on a buying spree. Spring Festival will see a lot more," he said. Experts, too, said the figures were encouraging. "Consumer power is still quite strong. People are willing to spend despite the global financial crisis," said Fan Ying, professor of economics at China Foreign Affairs University. "Though the rise came after retailers offered big discounts, the figures still look encouraging, given that investments and exports are sluggish." The robust consumption makes it more likely that the country's economy could pick up steam in the second half of this year. 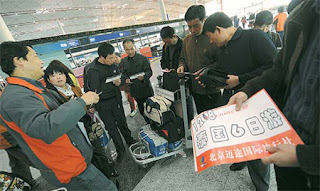 China Daily reports that spring festival sees outbound flood of Chinese tourists. Though financial woes have left Wall Street gloomy, it has not hindered Chinese tourists' enthusiasm to see the Wall Street Bull, the New York City's symbolic statue of financial optimism and prosperity. During the Spring Festival holiday, starting from January 25, the Big Apple is expected to be a travel hub and shopping paradise for Chinese tourists, due to the economic slowdown and yuan appreciation which have lead to falls in hotel and flight prices, discounted tour package and luxury shopping deals in the United States. In November a leading domestic travel agency, China International Travel Service (CITS) promoted a nine-day, 17,800-yuan-a-person group tour to the US during the Spring Festival period. Over 95 percent were booked by mid January, according to the deputy general manager of the CITS's Outbound Department, who called the figure "satisfying". The US is not the only hot destination for Chinese travelers. Other overseas markets, such as Europe, Australia and Japan will also feel the power of Chinese consumers during the Lunar New Year. According to Caissa International Travel Services, a well-known European travel agency and wholesaler, almost all its tours are sold out. "The conditions are more optimistic than we anticipated," said Chen Xiaobing, president of the private travel agency, while adding that Chinese consumers prefer to spend their money on cost-effective and "classic itineraries" rather than high-end products this year. He told China Business Weekly that prices of European packages have dropped due to the softened euro and Chinese tourists regard Europe as the best place to buy luxury products, especially in these economic times. Last year, Chinese travelers spent an average of $1,359 apiece on luxury goods in Europe, the highest amount across all destinations, according a survey conducted by Nielson Company and Pacific Asia Travel Association (PATA). "With the yuan becoming stronger against the euro, Chinese tourists need to pay only about 80 percent of what they paid for a product last year," said Zhang Hui, president of Tourism Development Research Institute, affiliated with Beijing International Studies University. Zhang predicted that there would be 10 percent more outbound travelers during this Spring Festival holiday than a year ago. This Lunar New Year, Chinese seem to be releasing a long suppressed desire to travel irrespective of whether there's a financial crisis or not. The blizzards that covered eastern and southern during the 2008 Spring Festival, the May 12 Sichuan earthquake and the Beijing Olympic Games in August of 2008 seem to have held them back from traveling last year. Hence, they seem to be "liberated" now, with some more eager to travel than before. My reaction: Chinese consumer spending seems to be holding up extremely well, and China's efforts to raise domestic consumption seem to be working. If retail sales keep up, we will soon see the discounts end replaced with price increases. The year of the Ox is just what’s needed to clean up any mess and clutter left by the Rat. The Ox is not as he appears and should not be underestimated or considered slow or unaware.